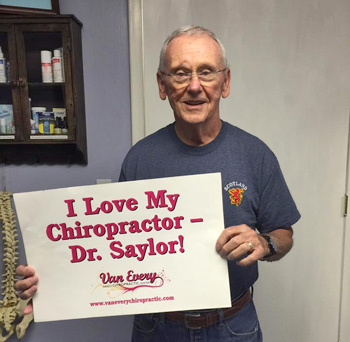 Welcome to Van Every Family Chiropractic Center! 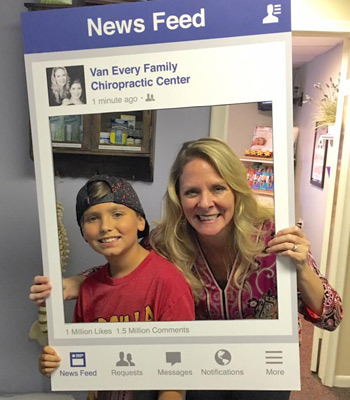 At Van Every Family Chiropractic Center, you’ll find a fun, energetic environment with a friendly staff ready to greet you. You’ll see all ages at our office, from babies and pregnant moms to seniors! Children are welcome to play in our Jungle Room with toys, books and a drawing board spread over two rooms dedicated to their enjoyment. We ask that you complete your new patient forms before your appointment. You can access them online by clicking below. If you’re not able to, please arrive a half-hour early to complete your paperwork. To learn more about what to expect at your first and second visits, please watch our orientation videos. When you arrive, we’ll collect your paperwork and get started on spinal scans. Taken with the Insight™ Subluxation Station, these scans allow us to assess any misalignments (or subluxations) present, assisting us in creating your personalized correction plan. If you have insurance coverage, we highly recommend that you contact your provider and ask the questions listed in this form. They will provide you with more accurate information regarding your coverage. The Insight™ Subluxation StationInsight™ Subluxation Station is a computerized, non-invasive & painless test consisting of thermal and surface electromyography (SEMG). We perform these scans to determine if chiropractic can help you. The scans are used to detect abnormal function, which cannot be seen on X-ray, and determine the presence of nervous system stress. The thermal scan will evaluate temperature on each side of your spine. Your skin temperature is controlled by the autonomic nervous system, which is that part of the nervous system that you don’t have to think about. Studies at Johns Hopkins University show that the body temperature on the left and right sides of your spine should be the same. A difference of body temperature on the right or left sides of your spine indicates stress on your autonomic nerves. The test enables us to determine what organs may be affected and the severity of the stress. The SEMG (static electromyography) scan will measure how your motor nerves are working. This is the part of the nervous system controlling muscles and movement. We are able to measure the amount of muscle spasms or weakness, which may indicate stress to your nervous system caused by subluxation. Disturbances in nervous system function will cause an abnormal amount of flow to the muscles on either side of the spine. As a result of this disturbance, the muscles can become weaker, tighter, or fatigued. This is measured through the SEMG. We’ll also conduct a Posture Analysis. We evaluate posture because it helps provide a look into the health of your spine. Correct posture allows muscles to work properly and decreases the wear and tear on joints. When there is extra stress on the spine degeneration of the joints can occur and may lead to long term health problems. All testing done is noninvasive and painless. When complete, you’re done for the day and will be scheduled back for a report of findings. When you return for your report of findings visit, your chiropractor will have had time to review your scans and create a plan that’s tailored to your needs. Over the course of an hour, we’ll detail our findings to you, explaining how we plan to help you. Your chiropractic adjustments will begin on this visit. At regular intervals, we’ll perform a new set of scans with the Insight Subluxation Station to see how you’ve progressed. We can then make any needed changes to your care. It’s important to us that you have the knowledge required to take better care of yourself and your health. We’ll give you handouts and other information that you can review or share with your family and friends. Are you curious about what chiropractic can do for you? Schedule your visit today! Saturday appointments are available.